Nextar may not be the first name you think of when you’re shopping for a portable GPS device, but the company’s Q4-MD is designed to compete head-on with models from TomTom and Garmin. While the Nextar device is easy to use, looks nice, and delivers (mostly) sensible routes, it lacks some of the refinements you’ll find on rival devices. 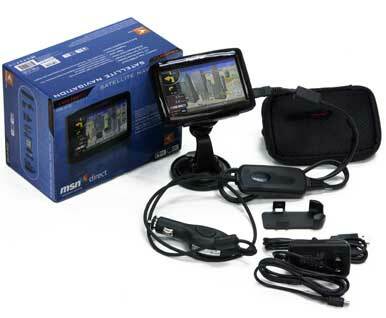 The Q4-MD’s features include a 4.3-inch touch screen, Tele Atlas maps of the United States (all 50 states) and Canada, a Point of Interests (POI) database with 1.6 million entries, a year’s subscription to the MSN Direct service (which costs $50 per year after that), and such useful accessories as a travel pouch, in-car and AC power adapters, and a stylus. When you turn on the Q4-MD, it presents you with a logical set of navigation choices, which isn’t always the case with other devices; you can search for an address or for a point of interest. When you enter an address, the device calculates the route quickly, and the navigation instructions begin right away. Unfortunately, you don’t get to look at an overview of the route at the outset; the Q4-MD simply tells you to proceed to the next turn. In contrast, most devices provide at least a brief summary (with total mileage and estimated travel time, for example) before you begin. You can find a summary of the route on the Nextar device by accessing its menu system, but I’d rather see one before I begin driving. The Q4-MD lets you select your route type during setup. You can choose among easy, economical, short, or fast routes. Unfortunately, I couldn’t find an easy way to change this preference on the fly. Once the device has calculated a route, the only clear way to alter it is to go back into the setup menu, select a different route type, and reenter your destination address. One additional (albeit minor) complaint: As you approach your destination, the Q4-MD doesn’t tell you what side of the road it’s on. This isn’t a big deal if you’re traveling on a residential street, but in busier areas it can be confusing. I found the spoken directions sufficiently loud, though users can’t change the voice from the generic, robotic sounding male option. The device includes text-to-speech, so it pronounces street names for you. Overall, the Q4-MD suggested very good routes. Still, there were occasional snafus. On one occasion, the device told me to get off of a highway, only to tell me the next minute to get right back on. But in my travels around the Boston area, it always got me quickly to my destination. Inserting a via point (an interim stop along your route) is easy: You simply type an address and select Add as via point. Many GPS devices lack this feature or make altering your established route unduly difficult, but the Q4-MD handles it smoothly. The included MSN Direct services are easy to use and nicely integrated. The traffic service rightly warned me of a delay near the Boston Garden before a Celtics game, and I had no trouble searching for the cheapest gas in my area. You can also search for movie times and get local weather updates. The Q4-MD has an SD Card slot, and it can play back MP3 files and display digital images. Unlike some high-end GPS devices, though, the Q4-MD doesn’t have lane assistance, which tells you which lane you should be driving in so that you can prepare for your next turn. It does show you road signs as they appear, however—and in Boston, where road signs seemingly change with the seasons, it handled this task accurately. As you approach a confusing intersection, the device shows you the signs you see on the road, and grays out the ones that you should ignore. While the Nextar Q4-MD lacks some of its competitors’ refined features (such as automatic route overviews and lane assistance) it’s still a solid choice for a portable GPS device.